Call us soppy romantics, but we like this story. A young man and a beautiful young woman from a tea plantation were in love, but the local tyrant seized her as his concubine. She escaped, only to learn that the tyrant had killed her lover. Finding his body deep in the mountains she wept and wept until she became the rain, while her lover’s body turned into a tea bush. Which is why, according to the legend, the area where Mao Feng tea grows is forever cloudy and humid the whole year round. All together now…ahhh! 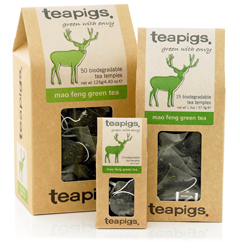 This tea is special, unlike any other green tea on the market. A green tea liked by people who don’t like green tea. In need of a make-over. Can’t afford rehab, liposuction or Botox? Why not settle for a nice cuppa. You may have heard about the many reputed benefits of drinking green tea, ranging from weight loss to anti-ageing.